28mm Victorian Warfare: A few more trees. Not a huge amount to crow about this morning, but I have managed to finish off a few more trees - three to be exact. They were done using the same technique that I had followed previously, a technique that was generously shared by the mischievous Loki of 'Loki's Great Hall' fame. Slow, but steady progress and good to see the forest taking shape; the previous efforts, including a quick 'how to', can be found here. Progress on the painting table has also been slow, but the newly rediscovered damaged stone walls have received a base coat - still a lot more to do there before they're finished. Finally to round off this morning's seemingly unrelated ramblings, I am delighted to say that I took procession of Tony Harwood's new terrain book this week, the unpretentiously titled, 'More Wargame Terrain'. Although, I have only managed a cursory look, I can tell you that it is presented in a similar format to Book 1, with plenty of wonderfully clear photographs detailing the construction of a myriad of useful terrain pieces ranging in difficulty and size - invaluable reference material and lots of ideas for future distractions, thank you Tony! Tony's book is available via his blog, 'DAMPF'S MODELLING PAGE'. Great trees and more ruins incoming. The table is going to be look great! Thank you Simon, although the table is now on hold! very good progress with your terrain and very good selection of DVDs! Excellent work on the trees. DVD's far to organised now. Embrace your inner teenager and keep them scattered in boxes and put the wrong ones back. You know you want to! Now for many years that's exactly how it was, but having them tidied away when married meant that I was missing out on some cracking films, this way they are far more accessible. Now that sounds good too, not heard of Slysoft before - off to investigate further. Buen trabajo ,en todo,por que anda que no tienes cosas puestas. Thank you J.D. there is always another distraction around the corner. Some impressive terrain, Michael. Really like the birches that are mixed in. The board is coming together rather nicely Michael. Like the idea with the DVD's may have to consider a similar solution, my youngest has one to many Barbie films! I see you have a few classics in there, no Barbie though! Reading Soloman Kane, essential reading for any witchfinder!! Thank you Mark, it certainly makes life easier when it come to selecting something to watch, but definitely no Barbie films. Nice work going on in the Cave, Michael. You've been busy, Michael. Nice trees and DVD storage work! Thank you Dean, there is always something else to do. I cut the cases up and use the plastic for bases for terrain and such things. Now that's an ingenious idea! Trees are always needed and those look great! Nice work with those trees! And creating order out of chaos in the storage department is always satisfying as well! Thank you Evan, but it would appear that I have underestimated just how much storage is required - there are a lot of films! Great trees dude! The table appears to be coming along splendidly. Storage is a bone of contention around our house too. Thank you Bob, sadly the house isn't growing at the same rate as the DVD collection! You've put together a nice looking woods for your monsters to hide in! I like those birches too I'll have to look back see how they were done. I'm currently in the DVD process of storage myself as well. Why oh why did I buy so many two disc special editions? Pointless! Trees look wonderful Michael! DVD storage can be a bit of a pain but it is so nice to have them! I bought a shelf made to hold dvds but when they went over 300 titles I cut back. Each of the cases hold 320 DVDs, we are now looking at investing in a fourth! Love the DVD collection. :) Didn't spot any DVDs on the Yes Prime Minister and Yes Minister series. Have you watched those? I watched them when I was just a kid of 12 way way back then (I guess I was just an old soul ... or a young kid with an old mind). ^_^ Most UK TV series reached my shores a few years late I think but I loved them all. Most of my peers were bored silly but for some reason I found them fascinating. There isn't so much TV in the collection, more recently with the WAlking Dead and that sort of thing. Yes Minister was a firm favourite at home and of course before the advent of satellite television they would be repeated often enough but would always raise a laugh. It has certainly made things easier here, credit to the Legatus. They are some really good looking trees there Michael! Really effective. I might steal the dvd idea as well now I think about it. Thank you Mike, as for the DVD storage - I just wish I had done it sooner! We have hundreds of DVDs. I remember the excitement when they came out, and the fact that they took up less storage than VHS video cassettes. Now, they look almost as clunky, sitting in their hundreds in an old bookcase. I like your storage idea, though. Oh, and the trees are wonderful! I don't think I will be able to throw them away either, at present they are heading to the loft! Be careful with the storage of those DVD cases! 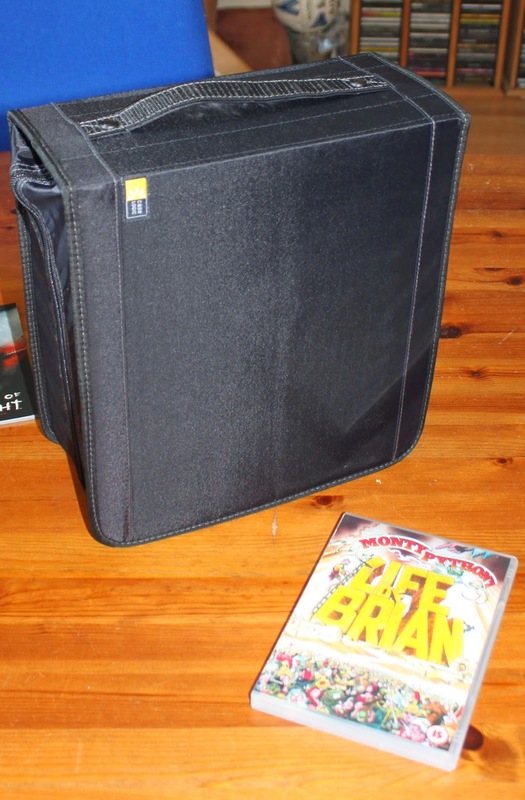 I transferred my entire CD collection into a series of those cases and eventually had to take them out again as a couple of the discs cracked and others got scuffed taking them in and out of the slip pockets. Eek! That doesn't sound good, thank you for the heads up Paul. Not a bad idea Phil, I guess ultimately the way things will go - it will certainly give us more space downstairs.